Thank you, Amazon Prime, for indulging my need to shop last-minute. Whether it’s holiday gift ideas or a birthday party gift I’m shopping for, two-day shipping always saves the day for me! If you’re also in need of some last-minute gift ideas, these Valentine’s Day Gifts from Amazon are sure to please! They’re pretty, affordable and will be delivered in jiff! Seriously, how cute is this Kate Spade umbrella?! It says “Love is in the air” in a lovely script and I love the clear dome. I’ve been eyeing this Marc Jacobs Snapshot crossbody bag, it’s just so petite and pretty! It comes in a ton of color options and has a dual zipper and rear pocket. I’m not usually one for heart-shaped things, but this gold Alex and Ani heart ring is so cute, and a total steal at under $30! Adidas is back in a big way for spring! I love this color combo as a Valentine’s Day gift idea, but the classic version with the black stripe is great, too. Facial rolling is great for stimulating collagen and helping to prevent wrinkles! This gift set includes both a rose quartz facial roller and a gua sha tool. I use my jade roller to help reduce eye puffiness. 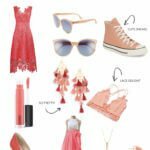 It wouldn’t be a complete list of Valentine’s Day gifts from Amazon if there wasn’t some sort of nightie or lingerie, right?! This satin PJ comes in pink, black or red with lace trim, and is under $20! I love a great layering necklace, and this 10k gold two-tone initial necklace is a fantastic piece to add to your jewelry collection. It’s under $50 and has timeless appeal. For a fun Valentine’s Day gift idea from Amazon, grab one of these Instax minis! It comes with a pack of instant film and is listed under $60! One of my go-to gift ideas is a makeup palette. And you can’t go wrong with this pretty Tarte Don’t Quit Your Day Dream Eye Shadow palette! 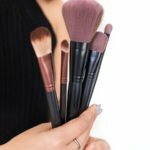 It’s under $30 and includes 7 neutral eyeshadow shades and a white-gold highlighter. Have you bought any Valentine’s Day gifts yet or are you a last-minute shopper too? Let me know! Um, I’ll take one of each please! 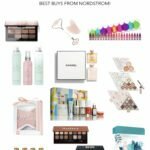 This is a fab gift roundup– perfect gift options! 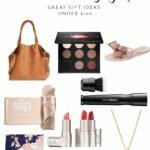 I am absolutely loving all of these cute Valentine’s Day gift ideas! I definitely need those sneaks in my life! I want all of these gifts for myself! I can be my own Valentine this year! Love all these choices!! That handbag is calling my name. I’ll have to forward this to my hubby. I should direct my hubby to this post! Would totally love any gift on this round up!